Pharmacists Vacancies in Primary Healthcare Department Punjab NTS jobs announced official. Primary Healthcare Department Punjab vacant vacancies Numerous posts for Pharmacists. 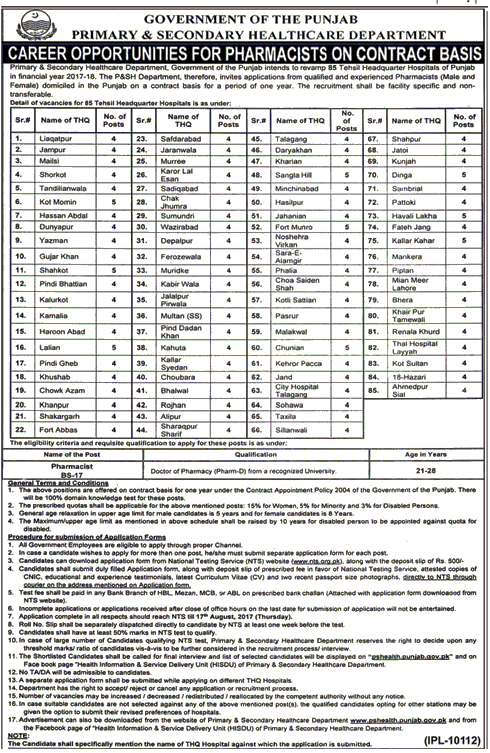 Primary and secondary health department Punjab Jobs 2019 District Wise advertisements and download application form with requirements, complete procedure to apply online. Primary and Secondary Healthcare Department Punjab announces aforesaid jobs for various 85 THQ along with its specification in current fiscal year 2019-2019. Certain jobs are also in pipeline and going to announce gradually. This initiative will not only revamp the health structure in hospitals but also eradicate the unemployment up to some extent. We provide you Primary and Secondary Healthcare Department Punjab jobs NTS online application form, shortlisted candidates for test as well as for interview schedule and final results are also dispatched here. P&SH target districts in which positions of pharmacists are going to announce includes Attock, Bhakkar, Bhawalnagar, Chinot, Chakwal, Hafizabad, Jhang, Jhelum, Kasur, Khanewal, Khushab, Layyah, Lodhran, Mandi Bahudin, Mianwali, Muzaffarabad, Nankana Sahib, Narowal, Okara, Okara south sity, Pakpattan, Rajanpur, Sheikhupura, Toba Tek Singh, Vehari. Whereas Tehsils include from punjab are Ahmed pur east, Arifwala, Burewala, Chichawatni, Chistitian, Daska, Esa khel, Gojra, Hazro, Kot addu, kamoki, Mian channu, Noorpur thal, shujabad, Taunsa. National Testing Service in Pakistan is involved in making arrangements for Conduction of tests, results, interviews and final results for these mentioned jobs accordingly. This recruitment process has been categorized and divided into 3-phase. All 3 phase are essential and interdependent. After final selection in final phase, selected candidates will be allocated to respective districts headquarters as well as tehsil headquarters hospitals. Aforementioned posts are offered on contract based according to contract policy 2004 of the government of the Punjab further extendable as per prevalent government policy at that time. In case of large number of candidates qualifying NTS test, Primary& Secondary healthcare department reserves the right to decide upon any threshold marks/ratios of candidates vis-a-vis to be further considered in the recruitment process/interview. Send filled up application form along with paid copy deposit of slip, attested copies of CNIC, curriculum Vitae, educational certificates, experience certificates at NTS Headquarter, 1-E, Street No 46, Sector I-8/2, Islamabad. Deposit fee Rs.500/- through online in any of the country wide online branches of ABL, UBL, HBL or MCB. Applications submitted by hand or at any other address will not be entertained. Applications complete in all respects should reach NTS till 17th August, 2019. For further update with respect to schedule, test deadline and final result please stay in touch with us.